I can still remember the first time I visited Montse and Carlos at their home, in April 2011. 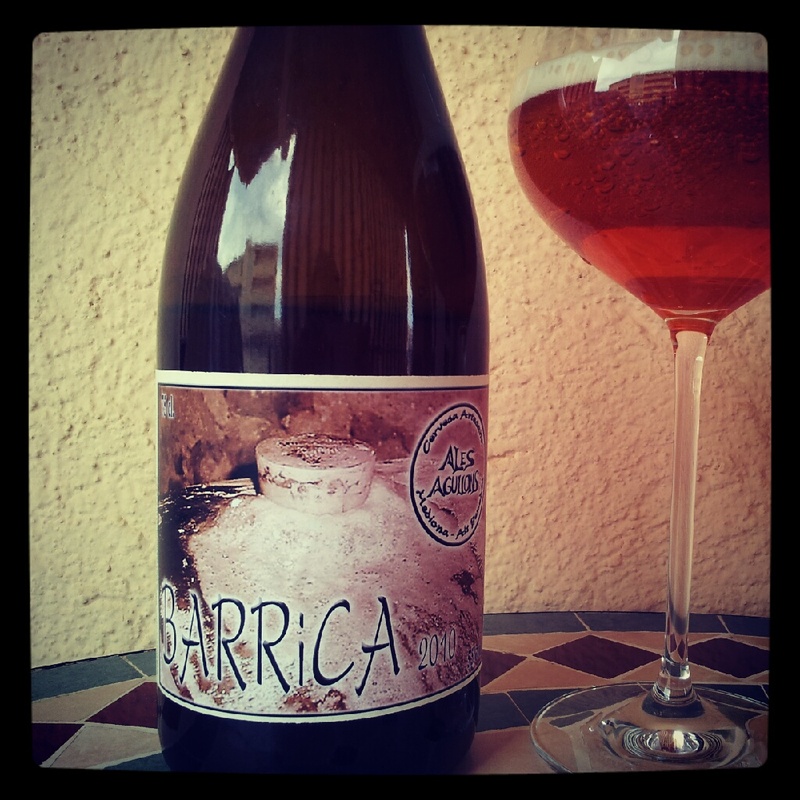 I met with a group of beer aficionados to pay a visit to a very remote place in Alt Penedès, a great wine territory, where some of the most popular and rare beers of the moment were being produced. It was supposed to be another beer-related visit, just like the ones I had been doing for some time thanks to the subtle microbrewing boom that had very recently taken place in Catalonia. But it turned out to be a turning point on the way I understood beer. Moreover, it progressively meant a vital change of perspective. On that sunny day of early spring I didn't visit a tiny brewery, not even a country house. That day I was invited to a true home. I met a hospitalary family that left everything behind during a period of economic growth. They switched a stable urban life for an uncertain one in a tiny little village of little more than 1.000 inhabitants. Idylic as it sounds, it can't be understood without years of sacrifices to pursue an own idea of a life-style. In 1998 a couple from Barcelona decided to leave it all behind to go and live in an ancient country house that was almost in ruins. What was the drive for such a bold step? Montse and Carlos in their cellar. The first country house we inhabited was not Masia Agullons, but one called Cal Casablanc, located in a different part of the village. It was in late 2000 that we began moving to our present home, where we have been living since 2001. That makes it 17 years in Mediona, 14 of which in Masia Agullons. We took the decision after reflecting on our lifestyle: we thought it was time to live our lifes in a different way. We wanted to get rid of the stress of living in a big city and lead a simple, quite life in a peaceful environment. How was your life in the village those first years? And what was the reaction of your relatives and close friends when you started this new life? In the beggining it was going back to square one. We began looking for whatever job, all of them related to field working. We found inspiration in a book by John Seymour about self-sufficiency. After reading it, we became interested on brewing on small scale. Our relatives and friends were quite astonished by our decision, in general terms. They thought that we were freezing cold and hungry, but it had nothing to do with that. 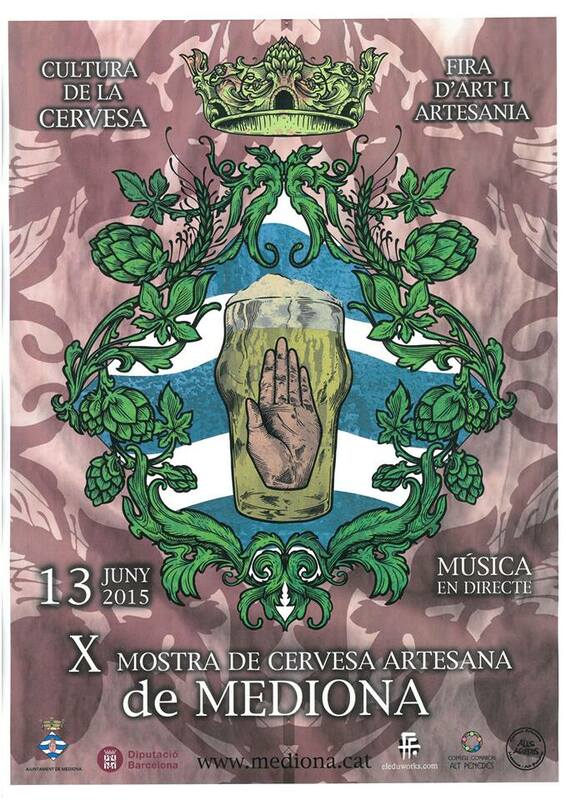 In 2006, some months after the foundation of the first microbrewery in our contry, you decide to organise a beer festival called Mostra de Cervesa Artesana de Mediona. Back then, there had just been one single beer-related festival here. What was your motivation to do so? What was your initial approach to it? At that time we had been in Masia Agullons for 5 years and we asked the council if we could set up a small exhibition of craft beer. We wanted to get people to know about what brewers were doing. We were hardly a soul at that moment, and mostly all of us were somehow linked to the brewing associations that had been promoting home brewing and craft beer since the late nineties. The whole lot agreed to do it in our village; they thought it would be fine. That's the way it started. Since that distant first edition, where exhibitors were mostly homebrewers, how has the festival and its organisation evolved? Our festival has evolved side by side with the craft beer scene in our country, bringing more people and brewers together, and with constantly rising beer quality standards. From the organisation we have been continuously adapting it to the circumstances of the moment. But the philosophy behind it is the same it was on day 1. We could say that the Festival has simply grown in the number of people involved, which for us it always means a little more effort than the year before. Two years later, you set up Ales Agullons. What was your drive? What profile did you want for your beers, and how has it been evolving since then? After brewing lots of beer at home, in 2005 we decided that it was time to take a step forward and buy the machinery we needed to set up a tiny brewery. Since the very beggining, we wanted to brew British-style Ales: simple but tasty, the kind of stuff you'd happily session. We still stick to it, but we have also added a new dimension by barrel ageing some of our beers, using alternative yeasts. 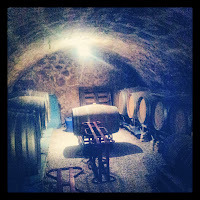 Barrel with "Setembre". Picture by Masia Agullons. Our local beer scene has changed dramatically. One can now find several beer events every weekend without much effort. Still, many local beer drinkers regard Mostra de Mediona as a special, unique event that has a distinctive character that no other event in our country has. What's the common factor of the nine past editions, this unique feature associated to your festival? We think that Mediona's festival is just a simple event that works good because of its main aim. We just want people to come and do normal things like drinking, eating, laughing or dancing. We expect our visitors to have plain unassuming fun: there's little time for more, because it only lasts a day. That's why both professionals and consumers want to make the most out of their trip to Mediona. About the present edition of the festival, has there been any difference in its preparation? Will there be any special treat for visitors to celebrate the anniversary? To say the truth, we have been feeling the same way as in the previous editions. Same nerves and same excitement. Sometimes it is hard when you're working on it, in part because you know that a lot of stuff can go wrong. But in the end you see the outcome and you feel satisfied of your spending of time and effort. For this X edition, the assistants can expect a big party like every year, with our local brewers being the main attraction, as they have always been before. In 2015, 63 different breweries (with their brewers) are coming with lots of different beer to taste. Many of them have been there almost since the first time, but some others are newer. Moreover, the local council contributes to the festival by bringing three music bands that will liven up the whole thing. However, there's one novelty that makes us happy. This time we will share the festival with some fellow Belgian people who have always been hospitable and generous with us. We are thrilled to count Jean Van Roy, from Brasserie Cantillon, among the lot, as well as our very good friends from Brasserie de la Senne. Back to the village, what's the bond between the town -institutions and population- and the brewery? Do your fellow citizens drink Ales Agullons? People from Mediona have always transmitted us that they feel proud to have an event like our Mostra de Cerveses Artesanes. The clue is that we throw this big party thinking of everyone. We can say that there's a strong tie with them. And yes, we are pleased to see that they like to drink our beers. How about your future plans, once this tenth edition is part of the history of our local beer scene? Please, tell us something about your principal projects and the things you'll be working on when your batteries are full again. Once this edition is past we will try to progress on one of the things we are being asked by most people: we have to brew more beer. Our current production doesn't meet the demand at all. 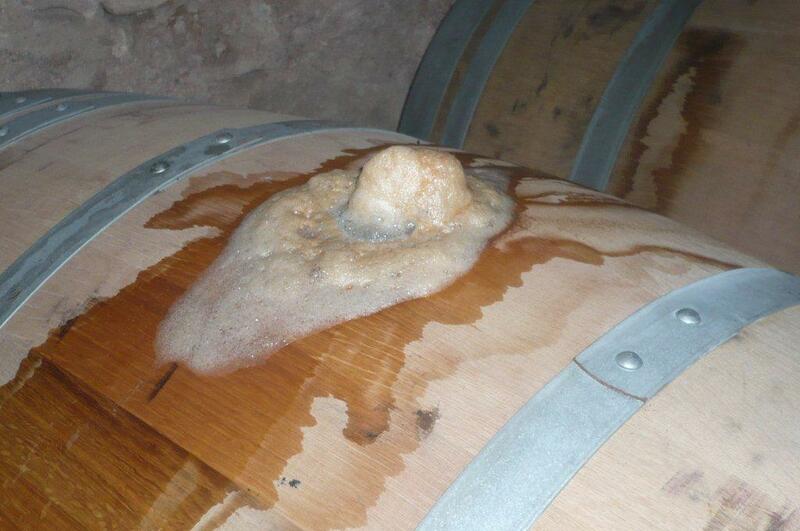 Besides, barrel aged beer needs to rest in our cellar for some time, so our products leave the premises more slowly. We also get many groups of visitors at home, which means that a great amount of beer is consumed in situ, while progressively the lesser part of it gets to the shops and bars. Your home and your festival are two of those places where I've found that thing that more than often I miss elsewhere. That thing that gives drinking beer that extra layer of pleasure, beyond the intake of a gastronomic product. More philosophically... what's the meaning of beer? 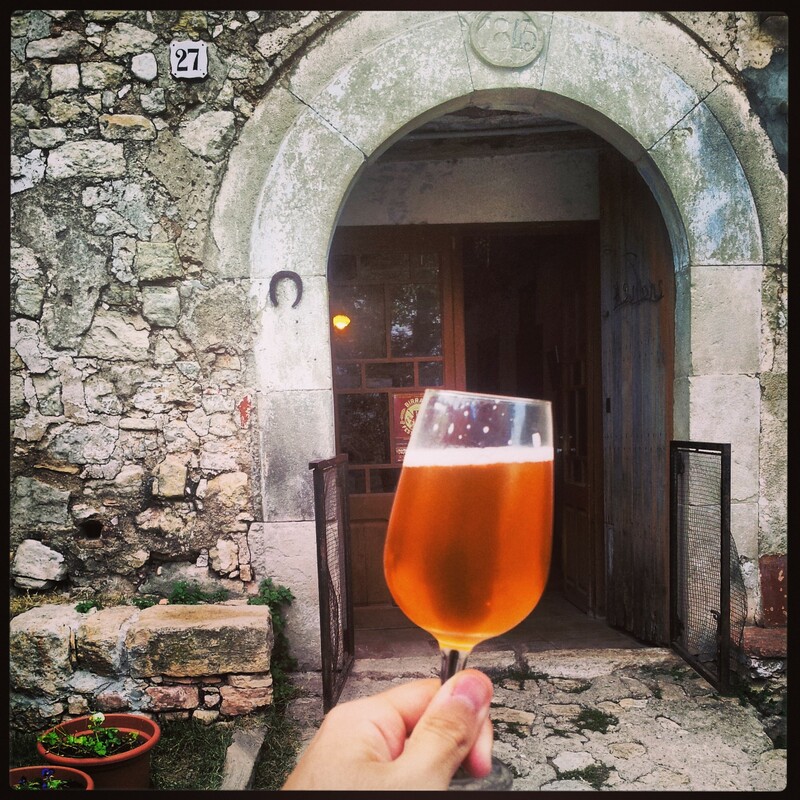 Beer has given us the life that we were seeking when we came to live in Sant Joan de Mediona. It hasn't been easy at all, and we think that we'd be talking about a whole different story if we had moved elsewhere. But we've been lucky; things have turned out fine. Beer is about enjoyment. To stop worrying about things, not the other way around. It is as plain simple as drinking, on your own or accompanied. Life's tough enough to dismiss the enjoyment of simple pleasures. Finally, we want to thank every single person that has somehow helped us reach the tenth edition of our Mostra de Mediona. We won't name any: there's too many of you. Carlos & me on Zwanze Day 2013, a relevant day for me. Picture by Jordi Bertran Hermosilla. As for me, I must thank you once again for everything you do so that we, the people who come and visit you, or the drinkers of your beer, can be a little happier, while inviting us to reassess the meaning of a concept such as sharing. Drank in Sheffield, Yesterday. Wetherspoons, Hillsborough. Cerveza Fort. Barcelona IPA. Enjoyed.